my back before I first discover this wonderful soap. Some scars that I have on my arms that I really hate so much diminishes by time and I charge it on my Dr. Kaufmann’s Sulfur Soap for making those scars happen to fade away. I have found out already the best soap that can actually help me. it is not harsh soap though but it can also, eventually, make your skin really dry especially when you leave it on your skin for a couple of minutes. The good thing is it also dries up the pimples or the skin irritations and so on but some areas which don’t need to be cured also dry up. So the best thing to do after taking a bath with Dr. Kaufmann’s Sulfur Soap is try to apply lots of good lotion or moisturizer. Wait for one more week. Usually, this soap starts to show result after two weeks of continuous use. Further, while using this soap, ensure that you rinse the face, or any area of your body where you have applied this soap, after five minutes of applying the soap. Let it work on the underlying problems your skin is facing. It will ensure quick result. Im using this soap to cure the redness of my skin . Its itchy and also because of severe dandruff. Is this really effective on my case. Your current problem seems to be a case of allergic reaction. You have redness and there is also itching sensation. Did you use any cosmetic product recently? Or have you taken any medicine in last few days? If yes, then that may be the reason. 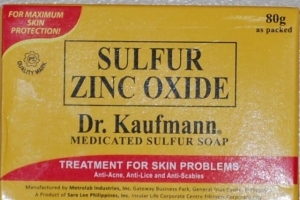 Dr. Kaufmann’s Sulfur Soap is unlikely to cure allergic problem. That will go away on its own. You can use Aloe Vera based herbal cream/gel on the affected area to get quick relief. Hiii. Is Dr. Kaufman Soap can be use for Psoriasis? A Psoriasis patient can use Sulfur soap. However, it can’t completely cure the problem. You are asking about the possibility of using this soap - YES, you can. You need to be in touch with your dermatologist for complete treatment. It is not only sneezes that is problematic. Dr. Kaufmann’s Sulfur Soap, or for that matter any other Sulfur or Salicylic Acid soap needs to be used on children with extra caution. If your child is suffering from any health issues, consult the doctor before using it. Further, this is not supposed to be used on children below 2 years old. Children are seen to be more sensitive to the effects of Sulfur soap. That is why, I think it should better be avoided on children. What soap is the best whitening skin? Try Clinique Even Better Skin Whitening Serum for really dramatic results in just a couple of weeks. I love this product, it has reduced my hyperpigmentation significantly and without the irritation that I got from skin bleaching products. Hi I like Palmer’s Scar Removal cream. It is about $ 5 at Walmart and has worked wonders on my hyperpigmentation and scars that I have from bug bites, acne, and other such things. I definitely recommend it. For whitening the skin I used Relumins Triple Papaya Kojic Whitening Bar. I loved it because it is made from natural ingredients without any chemicals. It will whiten your skin and remove at the same time the dead skin cells. Definitely, sulphur can be an overpowering smell. Try using a nice smelling moisturizer after. Normally you should cleanse your face twice a day, once after waking up and once before going to bed. If in the middle of the day you feel like you have some impurities on your face you can go ahead and use the soap to cleanse as well. Hi i have pimples on my chest and back dr.kaufamm soap is the best recommended for me??? There is no denying that Dr. Kaufman Soap gives good results when it comes to fighting pimples problems. You can definitely use it. Hi, I have acne on my face and currently using dr. kauffman. After cleansing, can I use my preferred face toner? Yes, you can definitely use your regular face toner, or any other product after cleaning the facial skin. Is the dr. Kaufman sulphur soap same as sastid soap? The active ingredient of both of these soap is Sulphur. Hence, you can say that both Dr. Kaufman and SAStid Soap are same. I use it on my face while showering. I wet the soap n my face of course. I rinse it off quickly after using it on the face. I didnt wait for it. Yes, you have used it correctly. In fact, there isn’t any different methods. Just use this soap the way you use your daily soap. No difference. You should see some results within 2-3 weeks of continuous use.